A 29-year-old man is expected to face a charge of animal cruelty after he abandoned his dog on Colorado mountain, the Clear Creek Sheriff’s Office officials said Friday. 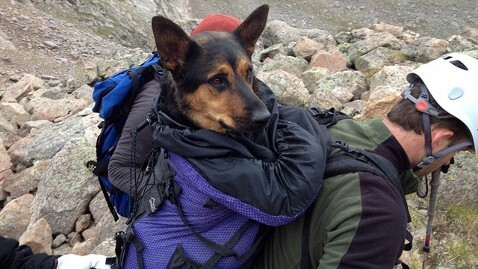 Anthony Joseph Ortolani told The Denver Channel earlier that he was forced to leave his German shepherd named Missy on the snow-capped peaks of Mount Bierstadt Aug. 5, when a storm moved in and he became worried for the safety of a younger hiker who was with him. He said his dog’s feet were cut up from walking on sharp rocks and it could no longer walk. ABC News’ previous efforts to reach Ortolani were unsuccessful. Scott Washburn and his wife, Amanda, found Missy Aug. 11, while they were on a leisurely hike up Mount Bierstadt. Washburn and his wife were incredulous at how this dog, tucked into a tiny nook between rocks, could have ended up where it was. The whimpering dog was, as Washburn said, “in awful shape.” He was convinced it would have died if left without food or water for much longer. The couple tried to coax the dog up out of the rocks and down the mountain but it was clear the dog was too injured and weak to move. Washburn got together a group of eight volunteers and the group headed back up the mountain that Monday morning. The group found the dog with all of its wounds Washburn had tried to bandage reopened. The rocks around the dog were covered in blood, and the dog was back cowering beneath the surrounding rocks. The group of eight hikers traveled through a full-blown snowstorm that broke out during their hike. Eventually, after a nine-hour rescue mission, the group successfully managed to bring back the broken and bruised dog in a hiker’s oversized backpack. Read more at Man Faces Animal Cruelty Charge After Abandoning Dog on Colorado Mountain – ABC News. This entry was posted in Animals Around the World, News and tagged Abandon dog on Colorado Mountain, Amanda Washburn, Anthony Joseph Ortolani, Missy the dog, Mount Bierstadt, Scott Washburn on August 20, 2012 by Belkis Cardona-Rivera.